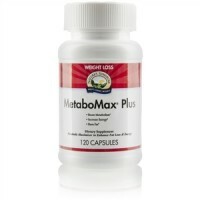 This formula was developed in tandem with MetaboMax Plus for those who desire a weight-management boost without caffeine. Its ingredients help increase thermogenesis and metabolic fat burn as part of a program that includes healthy diet and exercise. 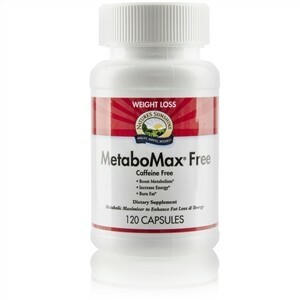 This effective blend may help boost calorie expenditure, helps promote fat burning and boosts energy levels. Capsicum and green tea combine to increase thermogenesis and decrease body fat. EGCG in green tea is a powerful antioxidant. Some studies show that green tea may have beneficial effects on maintaining cholesterol levels already within the normal range. Bitter orange fruit naturally contains synephrine, which helps the body use energy properly, stimulates metabolism, helps with the uptake of amino acids into muscle and increases lipolysis (the breakdown of fat). Ginger has been used traditionally to promote lypolisis and weight management and may have a metabolic-boosting effect. Chickweed is an essential ingredient in our popular Fat Grabbers product. Guggulipid herb contains guggulsterones, which, according to studies, help maintain cholesterol levels already within the normal range and decrease circulatory fat deposits. Guggulsterones may help reduce fat stores due to their thyroid-stimulating activity. 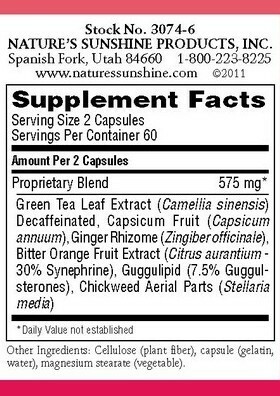 Decaffeinated green tea leaf extract, capsicum fruit, ginger rhizome, bitter orange fruit extract, guggulipid and chickweed aerial parts.